It’s true that the franchise experience isn’t as popular as it once was, but the idea that no one is interested in it at all anymore is not. A big part of NBA 2K’s success does come from its bevy of deep modes, which allows it to cater to everyone’s tastes. What we have in NBA Live’s Franchise mode is a vicious cycle that continues to stunt its growth. The lack of attention the mode has received has been attributed to its lack of popularity, but its lack of popularity stems from the fact that it’s bare bones and hasn’t received sufficient attention. Franchise won’t be popular as long as it’s lacking in basic staples, making the assessment of its popularity and value a self-fulfilling prophecy. In MyLEAGUE, NBA 2K has developed the deepest traditional franchise experience we’ve ever seen in basketball gaming, and arguably, sports gaming as a whole. Now, it would be impossible for NBA Live’s Franchise mode to catch up in a year, but it should be taking steps in that direction. If nothing else, it needs to be as deep as the old Dynasty modes in prior gen NBA Live, or more ideally, Association in prior gen NBA 2K. That would be a great first step. Considering that NBA Live introduced us to the concept back in 1999, a Franchise mode with significant depth, customisation options, and local multiplayer, is an idea that EA really must look to borrow. 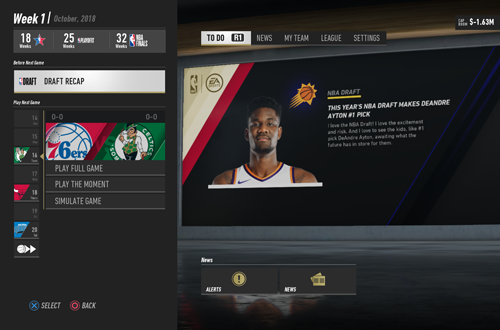 Even though I strongly disapprove of NBA 2K’s tendency to strong-arm gamers into microtransactions with its implementation of VC, and conversely applaud NBA Live’s usage of separate currencies for player upgrades and cosmetic items, there is a certain convenience in the way NBA 2K makes items available. 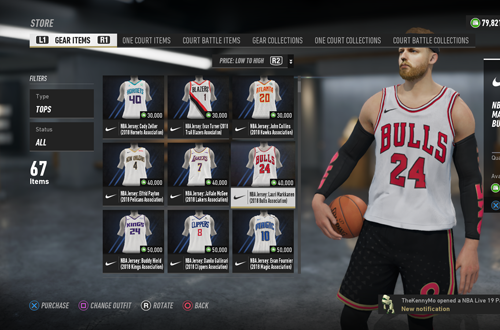 If I want to get a particular accessory for my player to wear in NBA 2K19’s MyCAREER, I know that I can pick up exactly what I want from the NBA Store, with basic accessories costing 100 VC. In NBA Live 19’s The One, however, I need to purchase a crate using Reward Points, and hope that I get what I want. If not, I’ll need to take a chance on another crate. The best of both worlds, in my view, would be the ability to use Reward Points to directly “purchase” any and all items. We have seen this concept employed in NBA Live 19’s The One Store when it comes to “deluxe” items such as featured clothing and Court Battles players, but a lot of basic items are acquired through the crate system. Honestly, I feel most basic accessories for The League should be available without having to purchase them directly or try your luck with a crate, but should acquiring them remain dependent on RP, I’d much rather get the accessories that I want, and only those accessories. Borrow NBA 2K’s store approach, but keep RP. Ultimate Team does have a couple of advantages over MyTEAM, namely its packs which include multiple players, and the removal of contracts in NBA Live 19. Apart from that, however, MyTEAM has grown into a far superior mode. 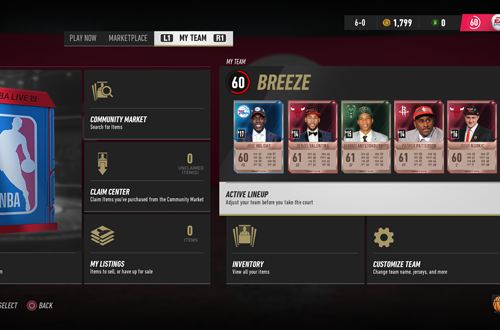 Considering that the card collecting/team building modes tend to be very popular – and a way to make money through microtransactions – it’s surprising that not only was Ultimate Team not improved upon in NBA Live 19, but actually regressed. I had so much fun with the mode in NBA Live 18 despite some of its shortcomings, but I haven’t felt inclined to touch it this year. Meanwhile, MyTEAM demonstrates what it could (and should) be. Let’s begin with card collections. Ultimate Team has continued to increase the number of cards that can be stored in your franchise, but MyTEAM does it better. While it’s very difficult, you could feasibly own every card that’s available in the mode. They’re presented in collection menus that also allow you to search for them in the Auction House, which is a nifty feature. The ability to create multiple lineups, redeemable rewards (a la Locker Codes), and a variety of themed packs, are all ideas to borrow. Finally, Ultimate Team should look to follow MyTEAM’s lead as far as including a variety of submodes to keep gameplay fun, interesting, and challenging all year. 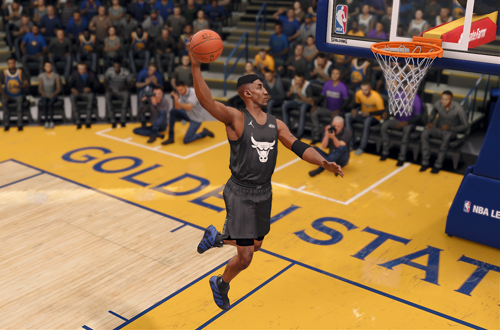 When roster editing was added to NBA Live 18 via a patch, it addressed a concern that had lingered since the reboot with NBA Live 14. The functionality is still there in NBA Live 19, but unfortunately, it could stand to be better. From bringing back the ability to trade players in addition to signing and assigning them, to an ability to share custom rosters with other gamers, there’s functionality that’s sorely needed in future releases. 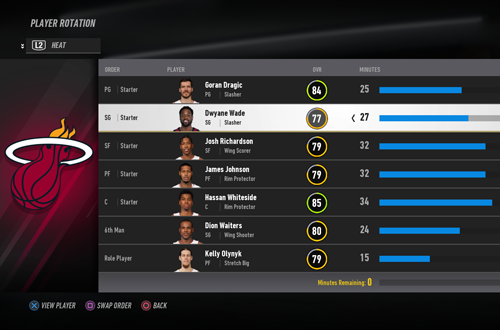 Over the years, NBA 2K has built up a fairly comprehensive suite of roster editing tools, so it would be to NBA Live’s benefit to take a glance at them, and copy some of the features that NBA 2K has boasted for quite a while now. Most of the player editing functionality in NBA Live 18 and NBA Live 19 is quite comprehensive, though one idea that could be borrowed from NBA 2K would be the ability to change player animation packages. In addition to the aforementioned trade function, NBA Live’s roster editing could benefit from deeper Create-a-Player tools, specifically the ability to morph headshapes and other aspects of the player models. Custom Draft Classes, and the ability to share rosters, sliders, and created player data, are all overdue. NBA 2K has had many of these features for years, and at this point, they’re basically standard for an NBA game. NBA Live needs to catch up. This is an area where NBA Live will have trouble competing with NBA 2K, but I feel that simply making an effort would appeal to basketball gamers. Currently, legends are only available in Ultimate Team, Court Battles, and LIVE Events. 2K has locked up historical teams, but NBA Live could still feature the old Decade All-Star squads, and a Legends Pool to mix retired players with current ones in custom rosters. The lack of retro jerseys has also been disappointing this generation. Featuring the retro uniforms that are being worn on select nights during the current season is nice, but it’s rather limited compared to NBA 2K’s selection, to say nothing of older NBA Lives. Packing NBA Live with content really should be a priority moving forward, as it’s only enhanced the appeal of NBA 2K. A phrase that you hear a lot when it comes to NBA Live (and I’ve used it myself in this very article) is “bare bones”. Currently, the game includes the bare necessities for an NBA licensed game, and with the standard that NBA 2K has set, some might argue it’s not even doing that. If we can play with the historical players outside of Ultimate Team and The One’s connected modes, pick from a big selection of retro jerseys (and collect them in LUT), and sink our teeth into a variety of content and deep modes, NBA Live will have plenty of lasting appeal. What other ideas would you have NBA Live borrow from NBA 2K? What are you hoping to see in NBA Live 20? Have your say in the comments section below, and if you do take the discussion to the NLSC Forum, remember to contribute to this year’s Wishlist while you’re there! That’s all for this week, so thanks for checking in, have a great weekend, and please join me again next Friday for another Five.